Vacation rental house. 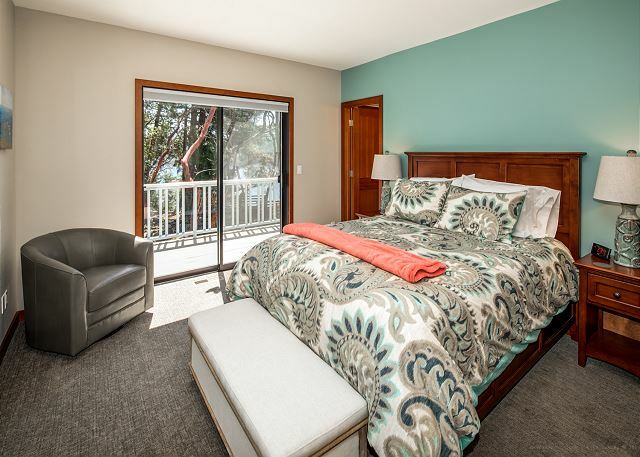 Sleeps 12, 4 bedrooms, 4 bathrooms. Dogs allowed. Comfortable lounge seating around the fire pit and adjacent to the hot tub and outdoor dining table for ten. And, of course, the front row views! An aerial view of Lighthouse at the Shore, showing surrounding decks on the waterside. On the closest deck corner is the hot tub and outdoor lounge system seating at least six, along with its built-in fire pit. The third story cupola is called the Crow's Nest. 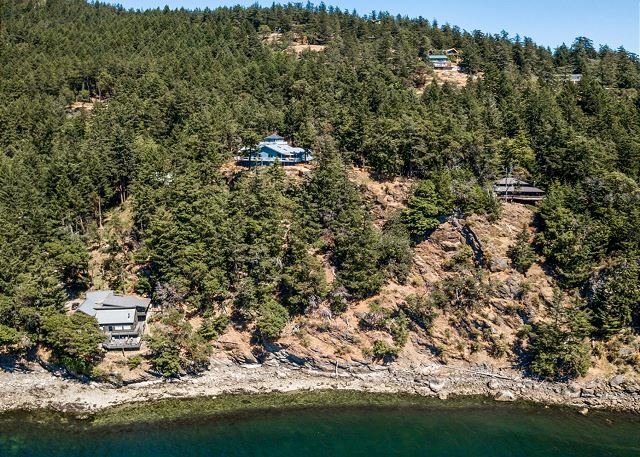 Another aerial view of this huge four-bedroom four- bathroom home on the edge of beautiful Eastsound, the waterway that almost splits Orcas Island into two halves. This aerial view shows Lighthouse high above the water, which only enhances its view up and down Eastsound. 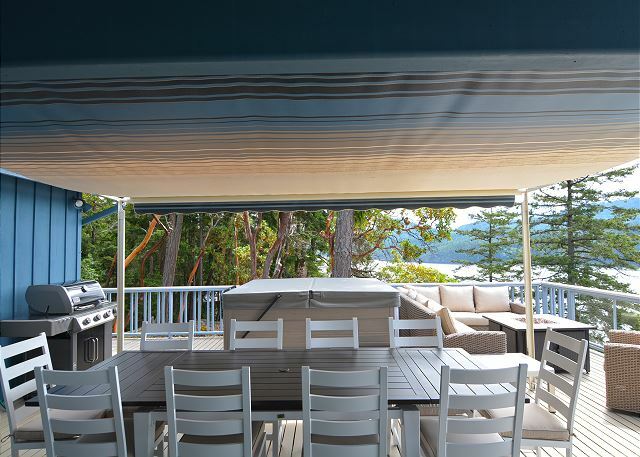 The Crow's Nest with its own deck and outside granite eating counter, plus lounging area. The entry side of Lighthouse on the Shore with paved entry drive and parking near the front door. Note the Crow's Nest widow's walk. View showing the south side of Lighthouse with water view and hot tub on this side of the home. 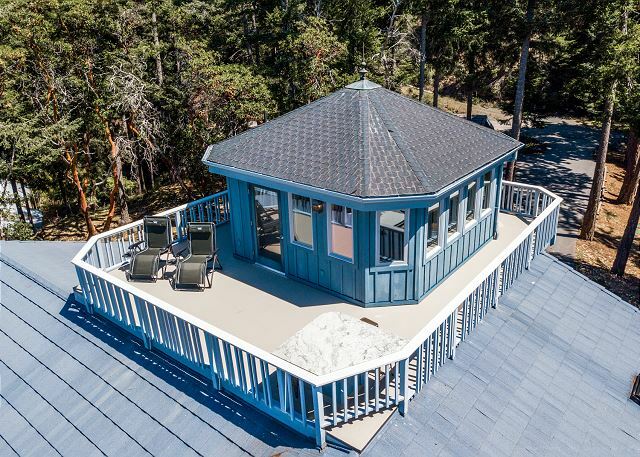 The Lighthouse's large outdoor deck with seven person hot tub, firepit, outdoor sectional and Weber Genesis BBQ All brand new! Another perspective of the outdoor activity area this beautiful home provides. 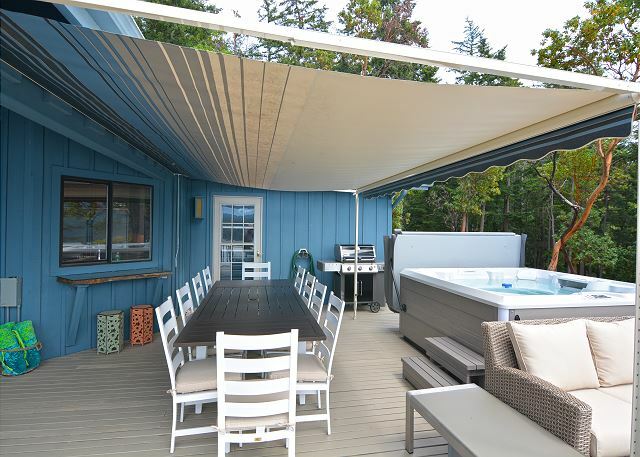 Note cover over dining table for ten, to keep you shaded on those warmer Orcas days. Dinner for ten, anyone? Weber Genesis BBQ in background, which is plumbed into the home propane supply system to put an end to ever changing propane bottles. And yes, yet another view perspective from this home! One more view. Note the cozy suspended chair...extremely comfortable. 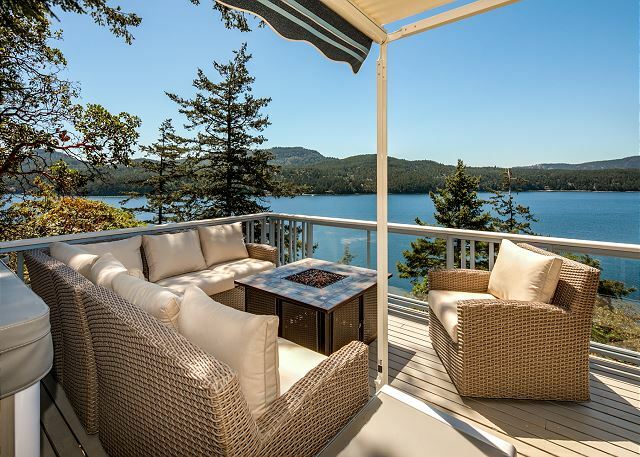 At the opposite end of the house you'll find a wonderful more private deck area with comfortable reclining lounges. 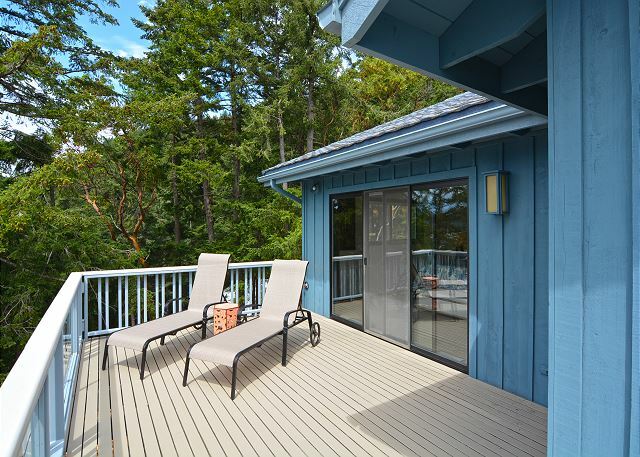 This deck area is located in front of the master bedroom, which is through the wall of glass behind the lounge chairs. 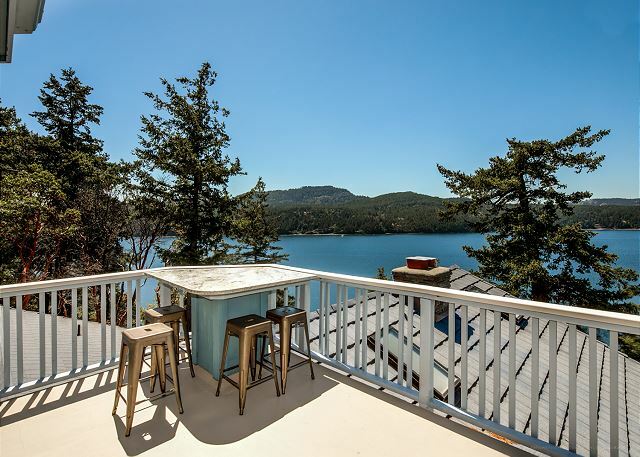 This view shows the third floor Crow's Nest with its granite table for drinks or snacks, all while enjoying the panoramic view of the Sound. And even more chairs, for relaxing on the upper Crow's Nest deck. This is truly "The Good Life." 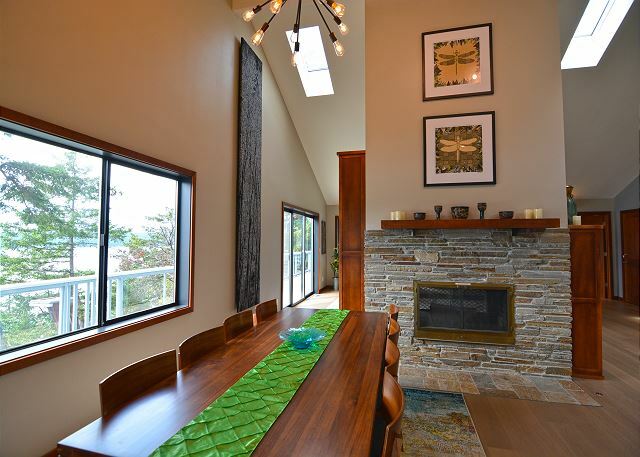 The Great Room with view of two-sided gas fireplace and beautiful Eastsound, through all of the windows. 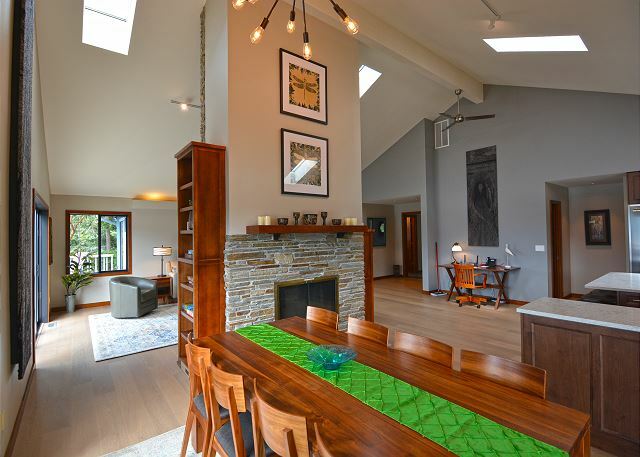 Vaulted ceilings with original art and tapestry on walls. Another view of the Great Room looking toward entryway and entry to master suite, with kitchen around fireplace to the right..
Lighthouse enjoys a two-sided gas fireplace, one side in dining/kitchen area and one facing the Great Room. Note original artwork above fireplace. The large dining table seats 8, with seating for three at the cooking island and seating for 10 on the covered outside deck. In other words, dining galore! 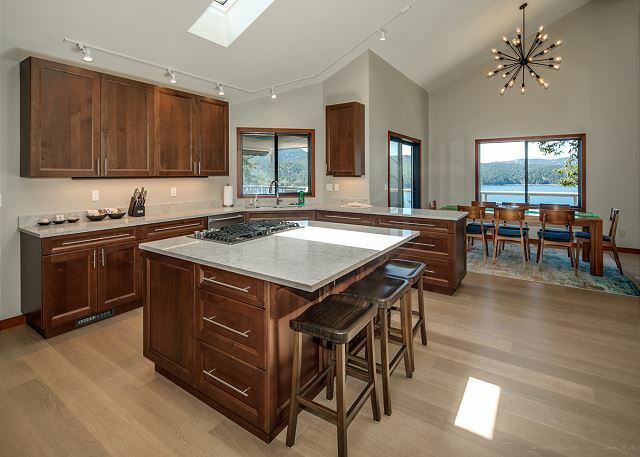 As with everything at the Lighthouse, the kitchen is all new from studs inward. Professional separate door full-size refrigerator and freezer. Gas cooktop with six burners. Counter seating for talking with the chef. The master bedroom suite with outdoor sitting area overlooking the water and connecting to deck area on kitchen-end of home. One of three UltraHD wall mounted televisions in the home. Beds have luxury linens and the same model of pillowtop mattresses used at the NY Ritz. 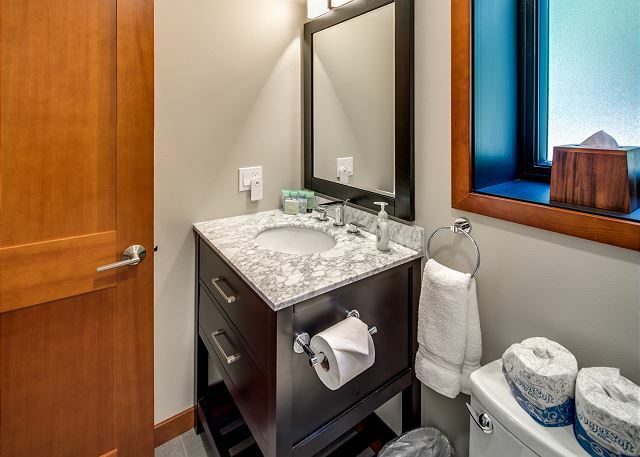 The dual vanity master bathroom is attached to the master bedroom. 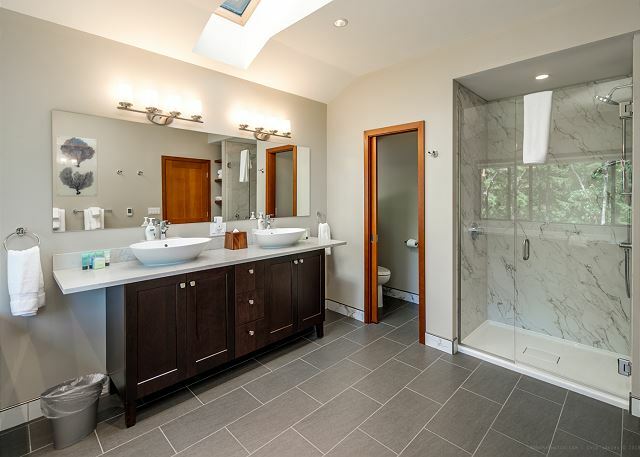 Heated tile floors and a large shower complete the luxury touches. The two person Kohler soaking tub is truly large enough for two comfortably. 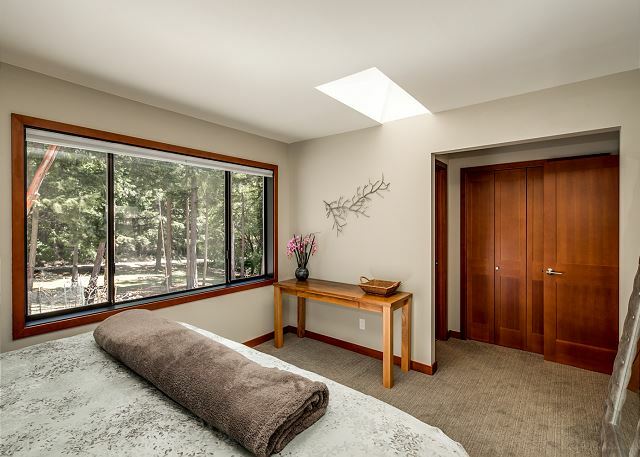 Enjoy the pastoral views out the window while you soak. There are no sight lines to other houses from anywhere inside The Lighthouse. The second ensuite bedroom with another Ritz king bed and adjacent bath with tub/shower combo. All walls, exterior and interior are thoroughly insulated for your privacy and a quiet night's sleep. View from bedroom #2 looking toward entry area with closet and bath to the left. Vanity in bedroom #2 bathroom. Note vertical grain fir doors throughout the home. Just part of the luxury provided in Lighthouse at the Shore. The bathroom #2 combo tub/shower. Of course it is 100% brand new. 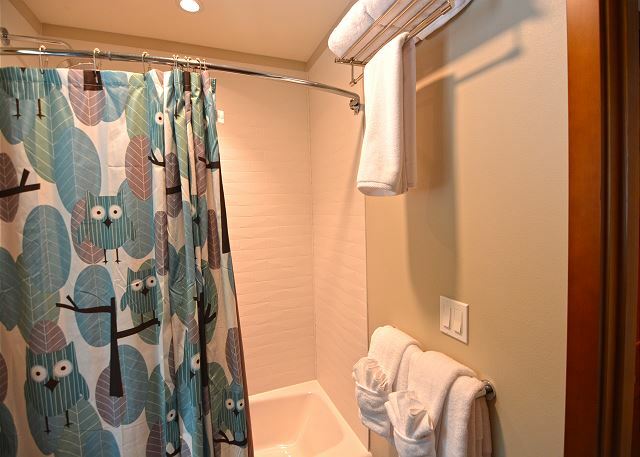 Luxury linens and towels throughout. Bedroom #3 with its private bath through door behind the bed. 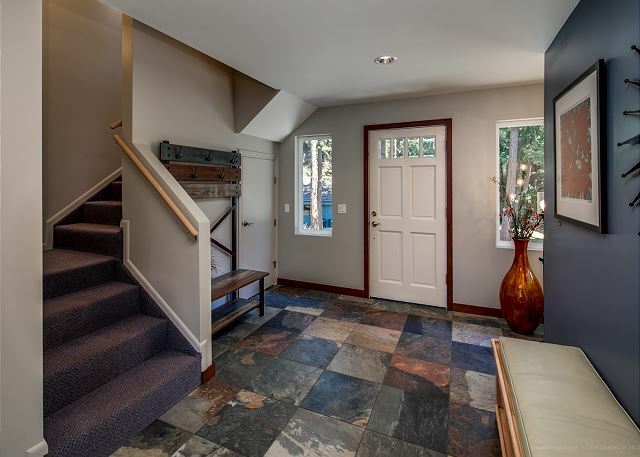 Access to outside deck and hot tub through sliding door for that late night soak. 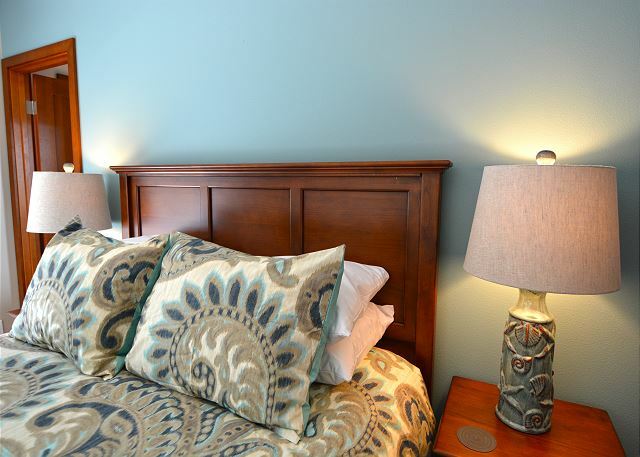 Bedroom #3 provides beautiful décor as does the entire home. 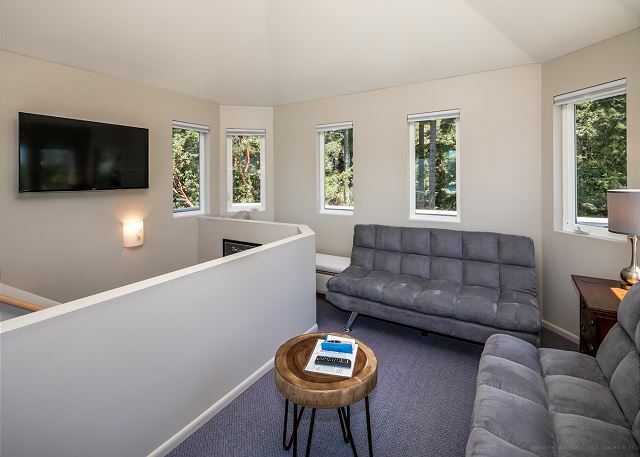 The Lighthouse entryway serves as Great Room access, but also provides stair access to the second and third levels where bedroom #4 and the Crow's Nest are located. Bedroom #4 on the second level is large and provides an extremely comfortable Beautyrest Black pillow-top mattress for your sleep. 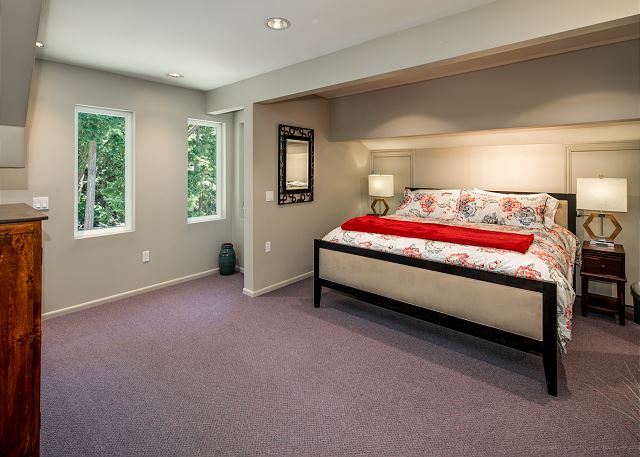 Like the entire home, this bedroom is air-conditioned. Another view of bedroom four, which is served by the downstairs entry/guest bathroom. Just one more flight of stairs up from here is the Crow's Nest, with its Ultra HD TV and a view you can only imagine. This is why it is called the Crow's Nest. Here is the Crow's Nest, with two euro loungers that each fold flat to provide an additional single bed equivalent sleeping location. A great place for two kids to sleep. A view of the Crow's Nest with its outside deck with built in dining/snack/refreshment table. And the view! The perfect place to enjoy the year-round sunsets. Entry/Guest bathroom that also serves bedroom #4 and the Crow's Nest. Another walk-in shower. 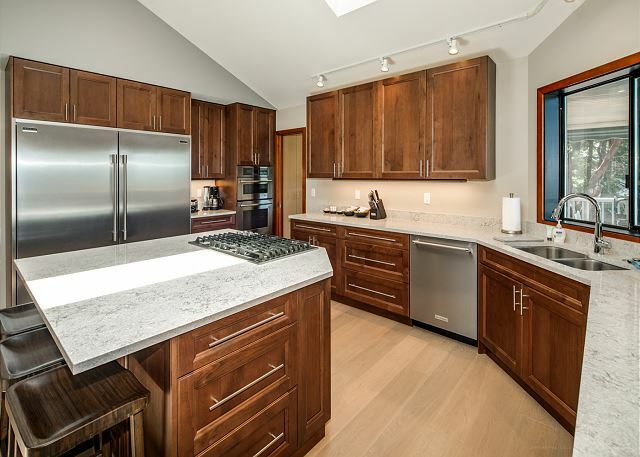 Lighthouse on the Shore is a home that has been completely rebuilt literally from the ground up, with an entirely new chef's kitchen, all new bathrooms, new hardwood, tile, and luxury carpet flooring, new decor and every bit of furnishing brand new. 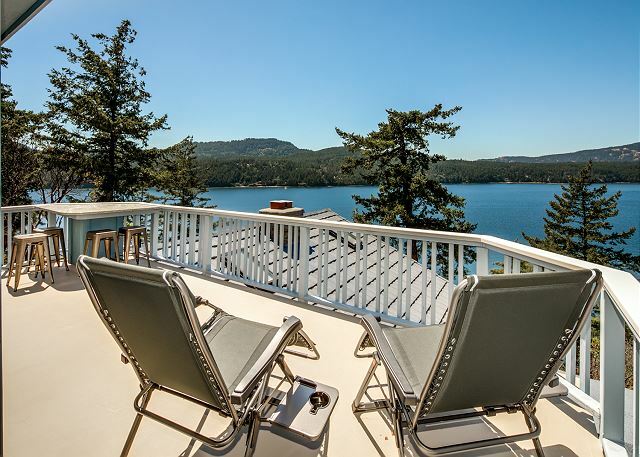 No expense spared in order to provide you the ultimate vacation retreat on Orcas Island. 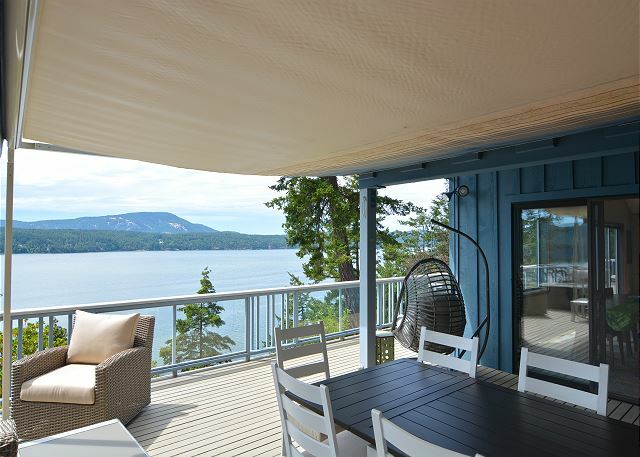 Sleeps twelve on three floors including the lighthouse perch high above the waters of Eastsound. 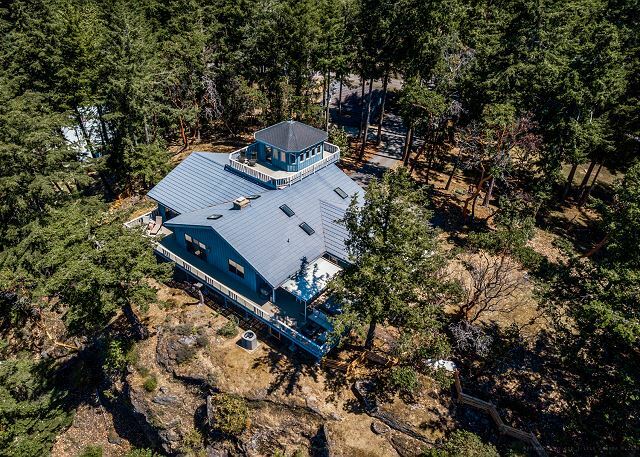 A truly unique home in our fleet of wonderful vacation homes in the San Juan Islands. Purchased fall of 2017, stripped to the studs and then carefully rebuilt to the highest construction standards. Furnished with luxury beds including Beautyrest "Heavenly" beds as found in the finest hotels, and completed with the best bed and bathroom linens. 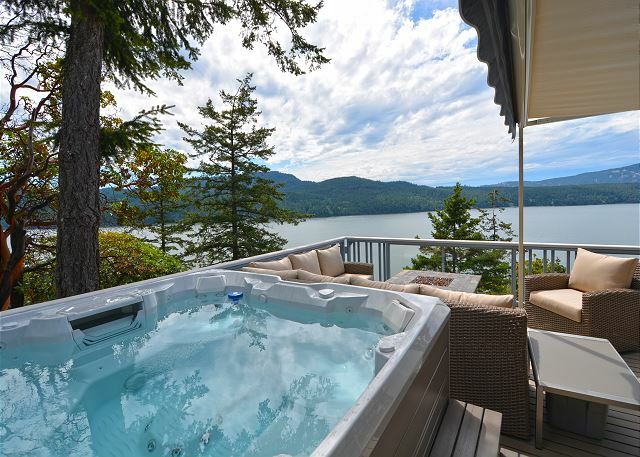 Outside there is an expansive waterfront deck with new seven-person Hot Springs hot tub, luxurious outdoor furnishings, a gas fire pit and Genesis BBQ. Inside, the Great Room has a vaulted ceiling and two-sided gas fireplace, dining room seating for 8 and 3 more at the cooking island to engage with the chef on duty. Outside there is dining seating for 10 with views of the water. 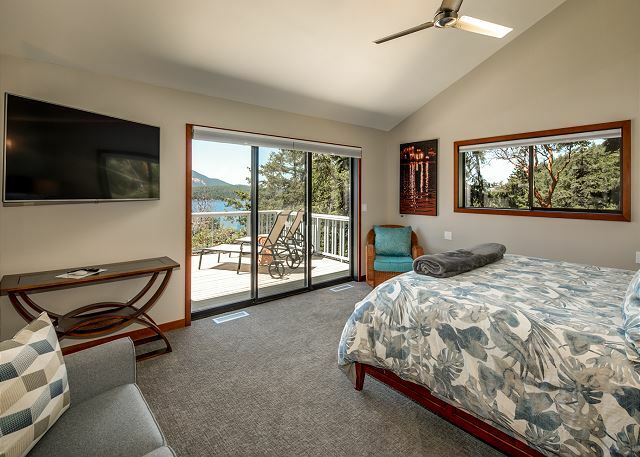 The master bedroom features its own outside deck and wonderful waterviews from your luxury bed, plus an expansive ensuite master bath, a 6 foot soaking tub also with outdoor views. 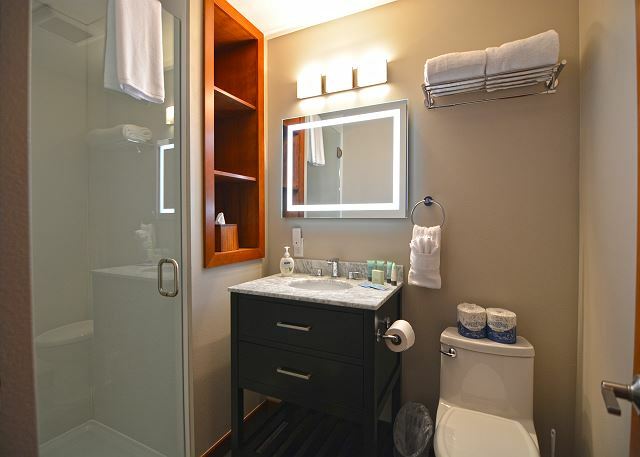 A double vanity and separate shower complete the accommodations. Bedroom #2 and #3, are located on the opposite end of the home each has its own tub/shower combination ensuite bathroom. Bedroom #4, located on the second level of the home, and the third floor Outlook area with its two Eurolounger sofa/beds (are ideal for children or a single adult each) both share the first floor guest bathroom with walk-in shower. The Outlook also includes a large screen HD smart television for entertaining parts of your family group. It also enjoys an outdoor observation deck with built-in granite table for wine and afternoon snacks that provides the best view on the island, and afternoon sunsets year-round. 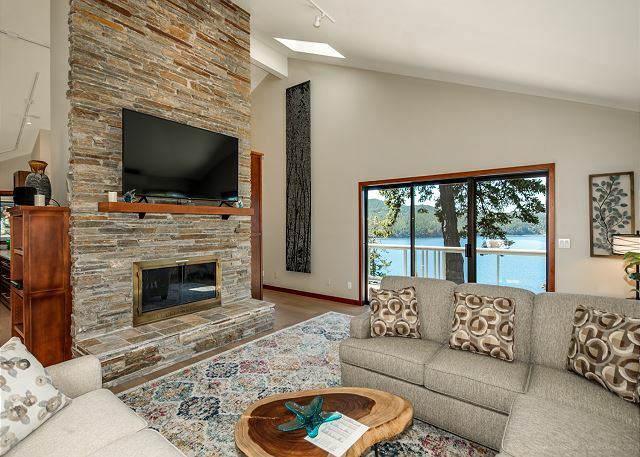 From an electronic point of view, the Great Room includes a 65" UltraHD smart television mounted on the living room side of the central fireplace and the Master bedroom includes a 55" Ultra HD wall mounted smart television. DirecTv and streaming Netflix and Amazon Prime complete the entertainment list. But, please know that the real entertainment is the way this home provides such extensive outdoor areas to be enjoyed. 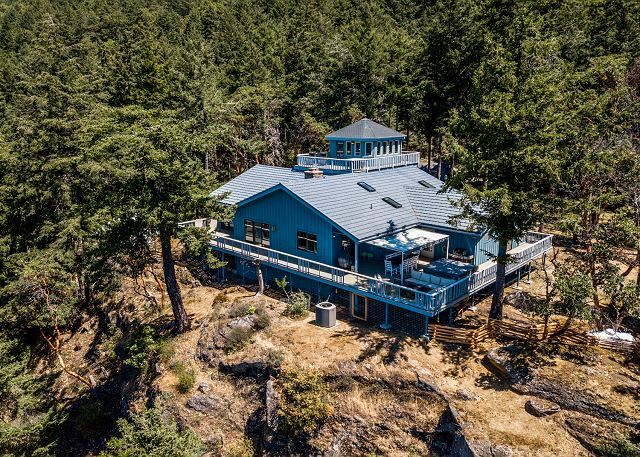 As with many waterfront homes in the Islands, Lighthouse on the Shore is high-bank waterfront and has steep drop offs between the house and the water. This drop off is protected by a continuous split rail fence to keep children from the drop-off danger. However, parents of young children should closely supervise all children while in residence at this home. 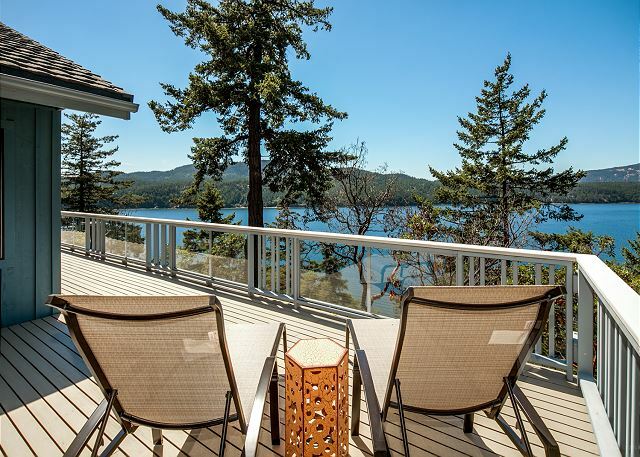 Beautiful home with spectacular views, accommodations and sparkling clean. We stayed for a 3 day weekend in March and lucked out with 3 sunny days. The place was great. Everything was as advertised. Lighthouse Bliss on Beautiful Orcas! This is one of the most beautiful houses I've ever stayed in. The light-filled home is SO welcoming and perfect for groups who want to spend quality time together in a serene waterside setting. 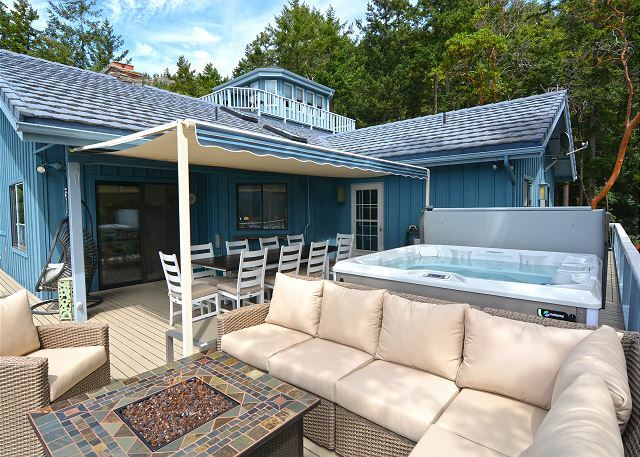 Highlights range from the soaring skylights and sprawling deck (with dreamy hot tub!) to a spacious kitchen and soothing, art-filled decor that makes one want to check in and never check out. The only disappointment was learning that the fireplace didn't work upon arrival (I had REALLY been looking forward to that!). Otherwise everything was top-notch and I would stay here again in a heartbeat. Thank you for the wonderful getaway in one of my favorite places on Earth! It was magic. We chose this amazing home to accommodate 11 people, including my 101 year old great aunt. Everyone was very comfortable and extremely impressed with the beautiful home- not to mention the view! It was quite cold out but we still enjoyed the hot tub and fire pit out on the deck. The kitchen, bathrooms, and rooms were well stocked and very clean. It felt like we were in a 5 star hotel for the weekend. Thank you! we loved this house. It was roomy and private for two couples. In the evening we would go to upstairs and watch the sun set. 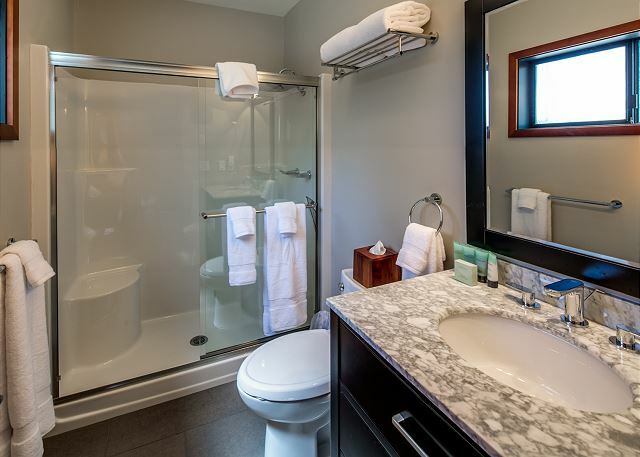 The master bedroom and bath are spacious and just beautiful. The view from the master is wonderful. 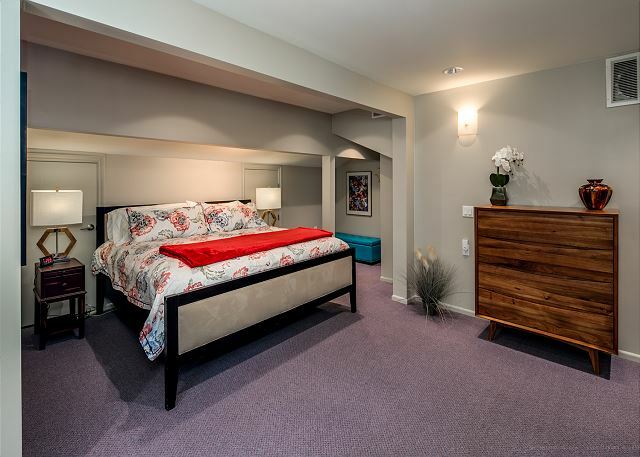 The other bedrooms are very nice too. The kitchen is open to the living area and is awesome. Will be back. The Lighthouse Vacation home was the nicest home we have ever rented in any Location in the US, hands down! My Wife and I rented the beautiful home for a week to celebrate our 35th Anniversary of our a Wedding. We wanted something that was upscale and private with ocean views. When we arrived at the house we couldn’t believe how nice the location was and how awesome the views were. 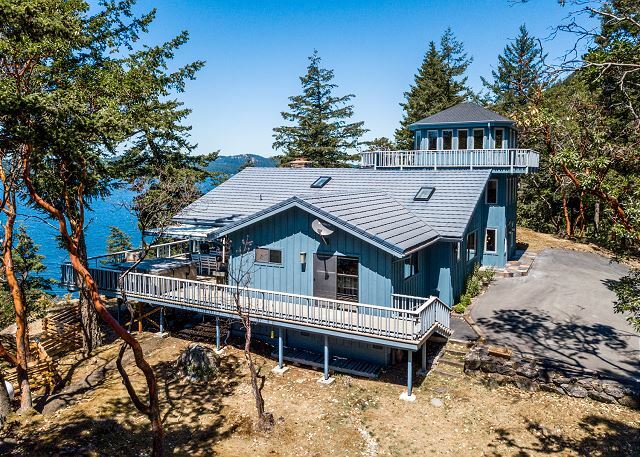 Opening the front doors and seeing the huge open floor plan, vaulted ceilings and windows looking out over the East Sound waters was jaw dropping. 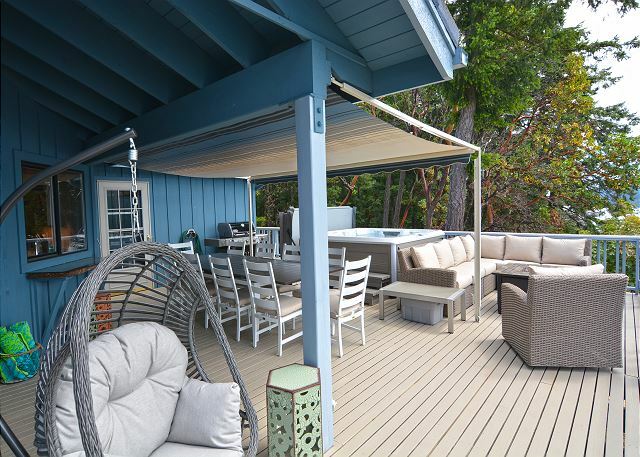 There are sliding glass doors leading out to decks that wrap around the entire house. The chaise lounge seating and outside fire pit was a great place to enjoy the sights and sounds of nature we just fabulous. There was also a large new hot tub on the deck that we used everyday in the morning and evening. You can sit in the tub with your cocktails and or coffee while enjoying the tub. It was full moon during the time spent there so the nights in the tub and the outside seating was like a romantic dream. The kitchen was a dream and we enjoyed cooking our meals and the double sided fire place that could be enjoyed from the dining room and the living room. 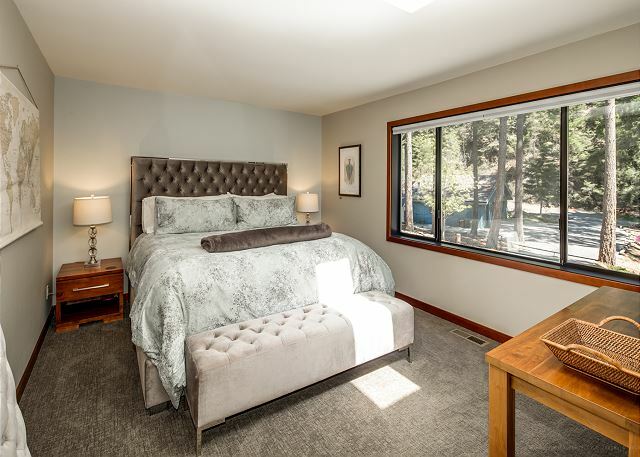 The master bedroom on the main floor was so comfortable and cozy with floor to ceiling sliding glass doors with spectacular views was memorable. 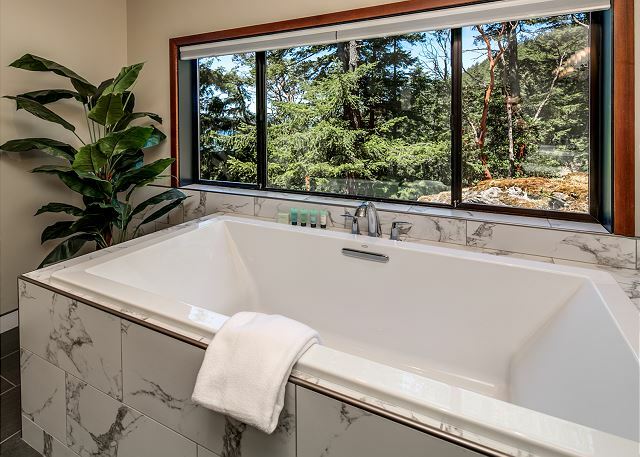 The master bath was very luxurious with a large double ended two person soaking tub with a large window looking out to the forest. We really enjoyed our time spent there at the light house vacation rental. We recommend this house to couples, families or groups. We will be booking this house again soon. 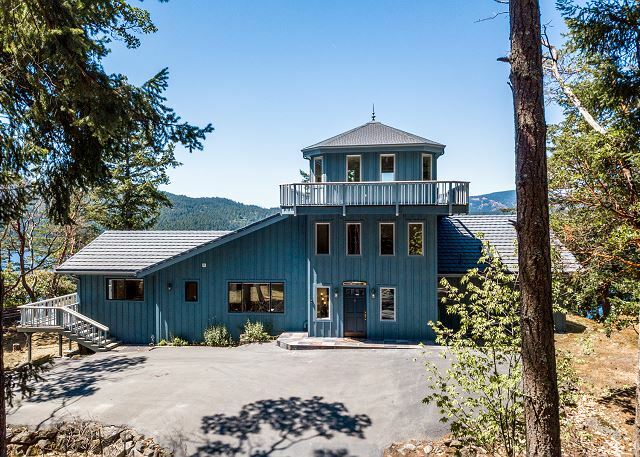 This house is an amazing place to gather as a family or for any other reason; just to be out in nature and enjoy the many wonders of Orcas Island. The owners John and Mariah did everything they could think of to make sure the house was ready and that we would have a wonderful time. The house has an amazing and private view of East Sound. The gas fire pit is a great place to gather on comfortable seating to enjoy the sunsets. The big hot tub was also a favorite family gathering place for watching the moon rise through the trees. The dining table and the nearby deck each seat ten and there is an awning over the deck table so we used both regularly after cooking delicious meals in the fabulous kitchen. We enjoyed paddle boating at nearby Cascade Lake, hiking to Obstruction Pass, swimming in the pool at nearby Rosario, climbing to the top of the view tower on Mt. Constitution in nearby Moran State Park. Beyond Moran, we enjoyed a great dinner at Doe Bay Café. We also enjoyed the gardens at Orcas Island Pottery and took a boat to Sucia Island and spent the day looking at tide pools and fossil beds, kayaking, and walking in the forest. The city Eastsound is only a few miles from the house and is a nice place to shop for ice cream, pastries, groceries, clothing, and souvenirs. The five grandchildren thoroughly enjoyed learning to play all the provided board games and using the big screen TV to watch photo slide shows of our past gatherings. All thirteen of us plus Milo the pup had a wonderful, refreshing time making sweet new memories.